The surface of a moon. Moon is a primary biome type characterized by dead airless worlds with no plants or life. Because moons have no atmosphere there is no color in the sky, simply a view of nearby planets and stars day and night. Moons are an 'Unknown' threat level, the ghosts on moons are deadly to players at all progression levels. Aside from ghosts there are no other dungeons, monsters or enemies to encounter. Moons often have low gravity, which increases player jump height and slows fall speed. 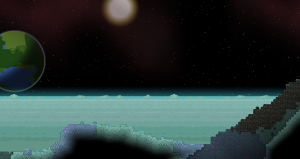 No Music Tracks play while the player is inside a Moon biome, though ambient noises still occur. Moons can be found orbiting all star types. Unless players have an Breathing EPP equipped they'll slowly run out of air while on moons, with S.A.I.L. warning the player that they're suffocating, and eventually taking damage when they've completely run out. Erchius Ghosts are the only unique monster found on moons. While on the surface players will have the spooked debuff, which draws ghosts toward them. Moons can be converted by using Terraformers, and upon converting removes the risk of Erchius Ghosts from spawning permanently. This moon supports no life and has no atmosphere. However, fuel is abundant here - scans indicate that there is a wealth of it buried below the surface. This vacant moon has no breathable atmosphere, but there are caverns below ground that contain vast fuel deposits. In summation: useful, but not enticing. A lonely moon with no breathable atmosphere; the sky is open to the stars, there is fuel below the ground. Likelihood of feeling lonesome and desolate: 92%. The surface layer of moons is primarily made up of moondust, along with moonrock and moonstone. The color of the moon in the navigation console closely matches the hue the materials on the moon will have. Moons do not have a lava core; instead, their cores are made of very hard stone called Dead Core. When you are deep down and your camera will not go any further, you are at the core. If you touch the bottom edge you'll die instantly, but due to how tough Dead Core is, it would take a very long time to even reach the bottom edge of the world. Crystal Erchius Fuel and Liquid Erchius Fuel can be seen glowing faintly purple beneath the ground. Liquid Erchius is found in greater abundance in caves below ground, while ore can often be found near the surface. Moon planets do not have any sub biomes which appear, and moons do not appear as a sub biome on any other planet types. There are no mini-biomes found on the surface or underground on moons. Moons have a fairly boring layer composition, though unlike Barren planets, it's very hard to accidentally tunnel down to death at the bottom of the core. There are no wild crops unique to moons, and since there are no mini or sub biomes there's no chance of finding any crops of any kind on the surface. There's only one monster type found on moons; Erchius Ghosts. These monsters are unique to moon biomes, and cannot be found on other planet types. They'll pursue the player, draining life if they get too close. They cannot be killed, but move slowly enough so they can be avoided. The more fuel the player collects, the faster they move. With about 3000 Items of fuel, they move about as fast as the player running on foot. They ensure players get in, get their fuel, and quickly exit moons. There are no critters or bugs which can be found on moons. There are no drops unique to moons. There are no villages or dungeons found on moons, they're too harsh to support any type of settlements. No village types have a chance of being found on moons. No dungeons can be found on moons.